HAIKOU, China, April 16, 2019 /PRNewswire/ -- From April 9 to 11, the foreign press tour "2019 Amazing Hainan" was held by the Publicity Department of CPC Hainan Provincial Committee in Hainan province. It was attended by journalists from eight major presses of the world, including European Pressphoto Agency, Agencia Lusa and Tokyo Shimbun. They visited Haikou, Chengmai, Qionghai, Lingshui, Sanya and Baoting, and acclaimed that "Hainan boasts bountiful tourism resources, and rapid growing Internet industry. The achievements of the FTZ are beyond imagination." A journalist from All-Russia State Television and Radio Broadcasting Company experiencing the acupuncture therapy and sharing his feelings to the camera. The Fuxing City International Offshore Innovation Building in Haikou has attracted many well-known enterprises such as Alibaba, Ant Financial Services Group and PwC, as well as many foreign "makers". Hainan Ecological Software Park is in Chengmai, which is home to more than 3,600 Internet companies, including some projects worth RMB 10 billion, such as Tencent Internet Village, China Game Cyberport Project and China Mind Sports Industrial Base Project. The cutting-edge technologies and the prospects have deeply impressed the group. Joao Pimenta from Agencia Lusa said that Hainan used to be known for tourism. Now, as the free trade one has been established, many R&D teams from the hi-tech industries start to settle in Hainan. Hainan has been promoting tax reduction, and he believes that the favorable policy will attract more foreign investment. Alexander Balitskiy from VGTRK took a great interest in traditional Chinese medicine. In the Boao TCM hospital, he shared his experience in acupuncture during the therapy. "It is amazing! We need to have more people to learn about TCM!" In the Binglanggu -- Hainan Li & Miao Cultural Heritage Park, many journalists were attracted by the traditional Li textile technique, which includes spinning, dyeing, weaving and embroidering and is on the List of Intangible Cultural Heritage in Need of Urgent Safeguarding of UNESCO. Apart from medical tourism, sports tourism, folk culture tourism, and duty-free tourism, Hainan is working to be more innovative in tourism. The journalists were also impressed by Atlantis Sanya and the Paddy Field National Park, underwater suites and many other upscale tourism products, and the integrated program of agriculture and tourism "expansive paddy field + large-scale artificial dinosaurs park". They believe that the rich and intriguing tourism programs will bring endless potential to the future development of the tourism in Hainan FTZ. SINGAPORE, April 16, 2019 /PRNewswire/ -- habitat by honestbee, the world's first tech-enabled food and grocery concept, has been voted by IGD as "the top 16 stores you must visit in 2019 in the world" and reported by Google as the top 10 trending searches in Singapore in 2018. Since the launch of its flagship 60,000 square feet store with over 20,000 essentials and unique products in mid October 2018, it has met with global success. From its early beginnings in 2015 as an online concierge and food delivery service, honestbee has expanded to a physical space in the form of a multi-sensory, omnichannel store format that serves both online and offline consumers, as well as a logistics and retail innovation lab. Nestled in Singapore's heartlands, habitat by honestbee has welcomed close to half a million visitors across all ages. Designed to be exploratory with elements of nature amid cosy settings, the space provides customers the comfort they would find in their own home. Coupled with the ease and array of products they need as well as world-class finds from all over the world, each trip is one that inspires. Customers are spending a longer time (2 hours) than in any other supermarket. Two of its largest groups of customers fall between the ages of 26 - 35 years old (41%) and 36 - 45 years old (28%). 64% of such customers are multi-generational families that visit the grocery and dining destination for its friendly neighbourhood feel. With the aim to create a community around food, habitat by honestbee's NewGen Retail concept continues to inspire more human interaction, leveraging technology to remove the unnecessary hassles of checkout lines and the handling of cash that come with shopping. In the app, ordering and payment features such as Scan & Go and in-app wallet, beePay, ensure a seamless experience. In-store checkout and collection points, AutoCheckout and RoboCollect, deliver a convenient alternative to traditional retail processes. In F&B, habitat by honestbee's innovation is in its multi-concept kitchen. A custom-built experiential space that's first in the world, it houses an F&B hall with 20 original concepts, from a Japanese-inspired craft coffeehouse to a Josper-grilled steakhouse. Each kitchen is maximised to ensure a strong sales return by operating multiple concepts in one space. This innovation sets habitat by honestbee apart from industry players in the market. Pauline Png, Managing Director of habitat by honestbee shared, "We are pleased to have had such a resounding success since the launch, not just with customers, but also with the business community in retail, property, grocery and F&B. A strong growth in sales pushes us to continue delivering a memorable experience for customers to visit, try new products and return. This tactility that habitat by honestbee provides ignites a curiosity for our products, which are also available online. In fact, we have observed a spike in online orders for Fresh supermarket deliveries since the launch"
Partnerships are core to habitat by honestbee's DNA. habitat by honestbee's ecosystem makes it convenient for collaborations with partners and F&B owners. Technological and operational costs as well as infrastructure and fixtures are borne by the company, allowing F&B partners to scale and focus on delivering quality experiences. Without worrying about the heavy risk of failure in traditional retail concepts, this maximises their revenue per square foot. A notable Singapore partner is Bear Bear Fresh, purveyors in sustainable seafood. Prior to partnering with honestbee, the supplier was solely Business-to-Business. By inhabiting a seafood counter at habitat by honestbee, Bear Bear Fresh is now able to reach out directly to their target market. Christopher Chan, Partner, shared, "We are happy to be able to interact with our customers such as families and the everyday shopper in person. habitat by honestbee's pioneering concept of NewGen Retail has empowered us to expand our business. We are looking forward to potentially expanding with the brand to other parts of Asia." habitat by honestbee has also partnered with Heineken® for their exclusive launch of Heineken® 0.0, its new non-alcoholic all-natural beer with only 69 calories. Faye Wee, Marketing Director of Asia Pacific Breweries (Singapore) Pte Ltd shared, "habitat by honestbee's Get Fresh! campaign made it the ideal platform to launch Heineken® 0.0. With our shared goal in providing healthier benefits to customers through food and groceries, our partnership saw a synergy from the start." What's next as honestbee continues to innovate? As part of its commitment to meet customer's needs, honestbee constantly reviews customer feedback and data to improve the 360-degree experience. For instance, after finding that customers often compile orders for families and friends together, honestbee will soon be providing an option to combine food carts on the app, enabling orders from multiple F&B concepts at habitat by honestbee in one receipt. This is an extension of our top local hawker centre experience already available on their online delivery app in Singapore. Engagement and retention are prime focus areas for honestbee. Customers will soon be able to make informed choices on the app with engaging product information and content. Personalised recommendations will also be available at habitat by honestbee via the app. By leveraging on data, the app will provide relevant recommendations for food, beverages and groceries based on an O2O algorithm. They have also launched their honestbee membership program, beeHive, where customers can get value deals for their groceries and food purchases both online and at habitat by honestbee. Joel Sng, CEO and Founder of honestbee shared, "The launch of habitat by honestbee has allowed us to elevate our business into an omnichannel platform and work with partners like no other online player can. We are pleased with the results over the last few months and continue to get a strong interest from prospective retail partners from around the world. habitat by honestbee has leveraged on our brand's promise and expertise in utilising data to optimise the customer experience. We are confident in fuelling the growth of habitat by honestbee to other markets. In the second quarter of the year, we will be extending our food-retail leadership in Asia by launching a scalable multi-concept kitchen and convenience store powered by data." The honestbee app is available for download via the App Store and Google Play Store. habitat by honestbee is the world's first tech-enabled, multi-sensory food wonderland - offering shoppers and diners convenience, value, quality, personalisation and a sense of community. The space utilises the world's first cashless, automated checkout (AutoCheckout) experience and robotic collection point (RoboCollect) and pioneers the 'NewGen Retail' concept - innovation in retail technology that inspires more human engagement for a multi-sensory shopping experience. Spanning over 60,000 square feet of food discoveries, visitors to habitat by honestbee can expect over 20,000 grocery products from Asia and across the globe, as well as 20 delectable food and beverage concepts. honestbee is Asia's leading marketplace that delivers quality food products and experiences, available in 16 cities across eight countries: Singapore, Japan, Thailand, Taiwan, the Philippines, Malaysia, Indonesia and Hong Kong. honestbee is passionate about making every life moment better through food. With a mission to be Asia's fastest-growing food service powered by community and technology, honestbee provides world-class, on-demand logistics, flexible jobs opportunities for their on-demand, independent bees and a strong network of 12,000 partners to deliver innovative services and concepts. The folks at honestbee are passionate about food and how technology can enable more in depth human experiences and moments around food. They employ more than a thousand staff all around Asia. KEELUNG, Taiwan, April 16, 2019 /PRNewswire/ -- Princess Cruises, the fastest growing global premium cruise line, welcomed the beautiful Majestic Princess back to Taiwan at the Port of Keelung on April 15. Last year, Majestic Princess was a talk of the town in the cruise vacation industry. To mark this occasion, Princess Cruises also officially announced the beginning of 2019 homeport season in Taiwan. According to internal surveys of Majestic Princess passengers in 2018, 90% were highly satisfied, and 97% would like to take Majestic Princess again. "Taiwan has become Princess Cruises' largest sourcing market in Asia, and our third largest market in the world," said Ryan Barton, Director, Marketing, International Markets, Princess Cruise. "With the upgraded services on the 2019 voyages, we look forward to triggering even higher popularity of cruise vacations!" At the beginning of 2019 season, Peter Chen, Princess Cruises Taiwan Region Director, also announced another great news. "Since the establishment of Princess Cruises Taiwan branch office in 2013," said Chen, "not only did Princess Cruises score high customer satisfaction but we also created a record of local purchasing of USD20 million in 2018, including food and beverage (local vegetables, fruits and rice grown in Taiwan) raw materials of roughly USD9 million. In 2019, it's estimated the purchase will exceed 20 million US dollars. As itinerary and passenger numbers have steadily increased over the past six years, in 2019, Princess Cruises will welcome the one millionth passenger traffic in Taiwan! We hope to see more and more Taiwanese guests onboard to experience complete and comfortable services on international premium cruise ships, as cruising becomes the fastest-growing vacation choice in Taiwan." "In 2018, Princess Cruises deployed three premium ships to Port of Keelung as home port for the first time," said Taiwan International Ports Corporation President Chungrung Wu. "Majestic Princess carried over 4,000 passengers in one voyage, the highest record in Port of Keelung. We are excited to welcome Majestic Princess back to Keelung. In response to three to four thousand customers in one call, we have redesigned the arrival and departure routes in Port of Keelung. E-Gate system will be available in the near future, and we will continue to upgrade the infrastructure to serve more cruise guests." "In 2018, Princess Cruises, for the first time, carried three premium ships homeporting at the Port of Keelung, and today I am very pleased to witness Majestic Princess' arrival for the second Spring/Summer Voyage," said Taiwan International Ports Corporation President Chungrung Wu. Majestic Princess recorded a groundbreaking number of more than 200 thousand passengers in 2018. Also, the Port of Keelung's cruise passenger growth rate is expected to peak at 14%, rounding up to 740 thousand passenger traffic this year. In 2019, Princess Cruises will offer 54 calls across 214 days, which are expected to carry over 150,000 passengers with Majestic Princess (from April to July) and Sun Princess (from July to September). Services onboard have upgraded as well. Firstly, Chinese-dish menu in the main dining room is redesigned by Michelin-star-rated Chef Richard Chen in Taiwan, the Executive Chef of Majestic Princess' "Harmony" restaurant. Secondly, as the global travel master, Princess Cruises is committed to delivering authentic destination experiences to our guests. We provide the "North to Alaska" experiences in Alaska, the "Across the Ditch" onboard activities in Australia and New Zealand, and most recently the "Rhythm of the Caribbean." Now, for the first time in Asia, we are proud to introduce "Spirit of Okinawa" onboard programming which features traditional dance activities, awamori tastings, regional culinary dishes, yukatas, and other immersive guest activities. Starting on April 15, 2019, an adorable six-meter-tall mascot of Princess Cruises, Stanley the Bear, will be placed on top of Keelung terminal building for one month. BALI, Indonesia, April 16, 2019 /PRNewswire/ -- As the day cools, the sun sets, and twilight takes over, prepare yourself for a completely unique island adventure tour where you are invited to enjoy, observe and interact with our exotic assortment of animals in their habitats. Experience Bali Zoo under the stars and discover the rarely seen sights and sounds of our nocturnal animals and begin the evening's escapade with sensory arrival by herds of deer at Deer Park. Continue your tour with a guided walk through Bali Zoo inviting your sense to come alive gazing to the natural sights and sounds of our tropical menagerie at night. Then we invite you to meet our gentle pachyderms and experience how it feels to actually feed these amazing mammals by hand from the top of double decker bus. Prepare yourself to get closer and followed by tiger feeding where our helpful zookeeper will assist you to learn more about this majestic creature. Head over to WANA Restaurant. Lounge. Bar for your special evening where you will be dining only a few meters from our resident pride of lions and enjoy unique experience of traditional Brazilian Churrasco with succulent cuts of meats served to you. The program for the evening end with the thrilling art of fire dancing and photo session with our troupe of elaborately attired dancers. "Night at the Zoo is such a highlight for visitors to be able to enjoy so much of what the zoo offers in atmosphere that something enchanting and mysterious to be among all the wildlife at night. Whether visiting as a couple or with the entire family, we can guarantee that your Night at The Zoo will be one night to remember," says Bali Zoo General Manager, Lesmana Putra. The package includes hotel return transfers, deer feeding, elephant feeding, guided night zoo tour, nocturnal animal encounters, dinner, fire dance show and insurance. Guided night walking tours and you will be greeted with a unique warm welcome from the friendly herds of deer. Meet our nocturnal animals during the magical twilight ambience at the zoo. Hop on a double decker bus ride from main area of the zoo to Kampung Sumatra area. Enjoy a hand feeding and photo session with the pachyderm from the top of a double decker bus. Enjoy sumptuous Brazilian Churrasco dinner overlooking the lions. If booking exceeds 20 pax, buffet dinner will be alternatively served. Experience the thrilling art of fire dancing. HO CHI MINH CITY, Vietnam, April 16, 2019 /PRNewswire/ -- Welcoming the vibrant summer, the new-age carrier Vietjet today opens ticket sales for its new international route connecting the biggest city of Vietnam, Ho Chi Minh City with Bali. Vietjet is the first and only airline to operate this route, which will better link the two tourist-attraction cities to meet the increasing travel demands of local people and tourists as well as boosting the regional trade promotion and integration. The Ho Chi Minh City -- Bali route will operate five return flights per week, on every Monday, Wednesday, Thursday, Friday, Sunday starting from May 29, 2019. Flying time is around 4 hours per leg. The flight departs from Ho Chi Minh City at 08:05 and arrives in Bali at 13:05. The return flight takes off from Bali at 14:05 and lands in Ho Chi Minh City at 17:05 (All in local times). Operating with Airbus A320-A320neo aircraft, the flight will be able to accommodate 180-230 passengers. Vietjet Vice President Nguyen Thanh Son said: "Vietjet has the advantages of an expanding flight network and comfortable, friendly aviation services; therefore, I believe that the new route will not only create opportunities for people to travel by safe, civilized and modern air transport, but also connect two cities as known as two economic, cultural centers of Vietnam and Indonesia. The route will contribute to promoting tourism and economic integration in the region as well as introduce the images of Vietnam to the world." Vietnam, the country of thousand years of culture was always a favorite destination of many international tourists. If Hanoi capital is a representative of ancient culture, bold identity; Hue ancient capital is dreaming or Da Nang, Quang Binh are impressive wonders, Ho Chi Minh City is Vietnam's largest economic, financial central, vibrant and modern travel destination. The culture exchange trend and retaining characteristics make image and beauty of one of the most dynamic cities of the S-shaped country. Connecting the two cultural cities of Vietnam and Indonesia will opens up new opportunities for both countries to maximize its top travel destination. Vietjet is the first airline to open direct routes between Ngurah Rai International Airport and Tan Son Nhat International Airport. The new route's tickets are now available on all channels as well as at golden hour promotion from 12:00 to 14:00 (GMT +7) everyday at website www.vietjetair.com, also compatible with through mobile devices at https://m.vietjetair.com. Payment can be easily made with international debit and credit cards, including Visa/ MasterCard/ AMEX/ JCB/ KCP/Union. Vietjet operates domestic and international routes with friendly, pretty cabin crews; serving fresh, hot meals on new aircraft equipped comfortable leather seats, with a technical reliability rate of 99.64% -- the highest rate in the Asia Pacific region. As a fully-fledged member of International Air Transport Association (IATA), Vietjet has obtained the IATA Operational Safety Audit (IOSA) certificate and has been awarded a 7-star ranking, the world's highest rate for safety, by AirlineRatings. Vietjet is the first airline in Vietnam to operate as a new-age airline offering flexible, cost-saving ticket fares and diversified services to meet customers' demands. It provides not only transport services but also uses the latest e-commerce technologies to offer various products and services for consumers. Vietjet is a fully-fledged member of International Air Transport Association (IATA) with the IATA Operational Safety Audit (IOSA) certificate. Vietjet was named "Best Ultra Low-Cost Airline 2018 - 2019" and awarded the highest ranking for safety with 7 stars in 2018 by the world's only safety and product rating website AirlineRatings.com. The airline has also been listed as one of the world's 50 best airlines for healthy financing and operations by Airfinance Journal in 2018. Currently, Vietjet operates around 400 flights daily, carrying more than 70 million passengers to date, with 108 routes covering destinations across Vietnam and international destinations such as Japan, Hong Kong, Singapore, South Korea, Taiwan, Mainland China, Thailand, Myanmar, Malaysia and Cambodia. 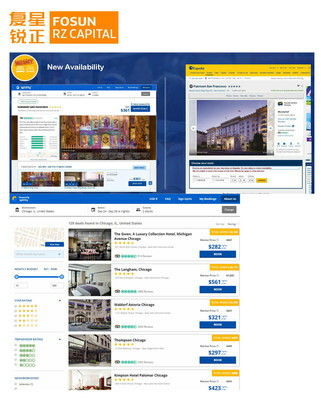 BEIJING, April 16, 2019 /PRNewswire/ -- Hotel booking platform Splitty announced that it has raised $6.75 million in a series A round of funding led by Fosun RZ Capital, the VC investment arm of Fosun International. 2bAngels, Techstars Ventures, Cockpit Innovation and 11-11 ventures also participated, enabling Splitty to expand its team and accelerate its global market growth in the coming years. Splitty, an Israeli-based startup, offers unique hotel prices, by taking advantage of splitting and combining multiple bookings under one reservation. Splitty analyzes and splits over 1.5 million transactions to create the exclusive deals in one second. They provide their services for more than 500,000 properties in 127 countries. Founded in 2015, Splitty has been focusing on developing its technology and was launched in the market in 2018. In 2017, they won the Start-up Award at the Eye for Travel San Francisco. Fosun RZ Capital launched its Israel office in 2018 and is already represented in five other countries with global teams. Chairman of the lead investor Jin Hualong commented, "Our investment strategy in Israel will be more focused on high-end technology, which aligns strategically with what we have in the China market". Splitty will be a landmark in Fosun RZ Capital's travel tech distribution. With its 'Split & Match' technology, Splitty has driven the innovation of the traditional OTA model and provided the best solution for both users and hotels. Fosun has been centered around its worldwide family customers and created an ecosystem of 'Health, Happiness and Wealth'. Splitty will play a connecting role between Fosun and other platforms in the tourism industry, while diversifying traveling options for family customers as part of Fosun's 'Happiness' ecosystem. "Splitty differentiates itself from traditional OTA through this transaction model", says Eran Shust, Splitty's CEO. "It's a win-win situation - we could improve the occupancy rate of hotels by over 15%, while users enjoying lower prices up to 50%. Fosun RZ Capital is the perfect partner for us to bolster our business globally". Currently, Splitty provides room booking options mainly in Europe and America. Since China has become the largest consuming market in the international tourism industry, the company is planning to expand its business in the Asian market right after the completion of this round of financing. For more information on Splitty, visit www.splittytravel.com or eran@splittytravel.com. 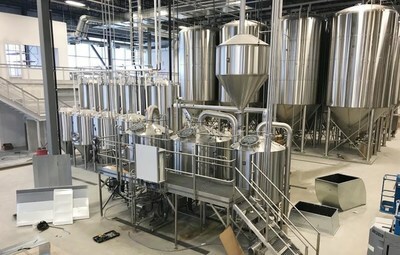 SHENZHEN, China, April 15, 2019 /PRNewswire/ -- Chinese transportation equipment solution provider China International Marine Containers (CIMC) announced that it had taken control of Canadian brewing machine maker Diversified Metal Engineering (DME) in a move to further expand its presence in the North American market. The acquisition was made by Netherlands-based CIMC Enric Tank & Process (CETP). CETP is a subsidiary of CIMC Enric Holdings, a Hong Kong stock exchange-listed company, which in turn is a subsidiary of CIMC. It was CIMC Enric's fourth significant acquisition in global food and beverage machinery industry after buying Holvrieka, a Dutch stainless-steel tanks maker, Zimann, a German brewery equipment maker and Briggs, a British beer equipment company. The move will pave the way for achieving the company's ambition of becoming a world-leading equipment and engineering service provider in the craft beer business. "In developed markets such as Europe and the United States, beer making industry has entered a mature phase. Traditional mass-produced beer cannot meet consumers' demand for customized craft beer and that with lower alcohol content. Against the backdrop, craft beer has become a new trend of consumption in those areas," said Leo Yang, general manager and executive director of CIMC Enric. "Based on extensive market research, we believe there is huge potential in the business and, therefore, we have been tracking beer equipment industry actively in recent years," Yang said, noting that DME's craft beer business matches the company's strategic vision. "Despite previous moves of acquisition in global beer equipment business, we still take up a relatively small share in the North American market. The acquisition will help us to expand our presence there," he added. According to global market research firm Global Market Insights, North America, led by industry players from the US, Canada and Mexico, is expected to take up over 45 percent of the world's craft beer equipment market share. Market size of global craft beer is projected to hit US$500 billion. Marc de Jong, managing director of DME Process Systems Ltd, the new company set up after the acquisition, said CETP's innovative capability, market share, global manufacturing bases and rich experience will help enhance its brand recognition across the world. Ko Brink, chief executive officer of CETP, said the new partnership will promote growth of the two sides. "The DME Group brings us an experienced team as well as a great customer base, which allows us to further increase our presence in North America. Also, adding DME/NSI to our group brings two strong brands in the (craft) brewing industry that will greatly contribute to our existing brand portfolio," he said. Apart from the developed markets, CIMC Enric is also setting its sights on emerging markets, believing Asia Pacific and Middle East regions, especially China, will emerge as a key driver of growth in the coming few years. "With consumption upgrade in China, Chinese people are now pursuing high-quality life and their demand for craft beer is growing. The rapid increase in the number of returnees has also driven the trend. According to industry data, although craft beer now only accounts for less than 1 percent of Chinese beer market, it is growing at a pace of 40 percent per year," Yang said. Entry into Chinese craft beer market is DME's vital step in its globalization strategy, he said. To better explore the Chinese market, DME will establish its Asia sales office in Shanghai and set up production lines in CIMC Enric's factory in Nantong, China's eastern Jiangsu province, so as to gain cost advantages. "By taking advantage of CIMC's resources, DME will achieve a great development in the Asia Pacific market," Yang said. CIMC Enric posted 13.05 billion yuan (US$1.94 billion) in revenue in 2018, growing 21.9 percent year-on-year. Net profit of the company surged 87 percent on a yearly basis to 786 million yuan last year. SHANGHAI, April 12, 2019 /PRNewswire/ -- The 12th TTG China Travel Awards Ceremony was held in Shanghai recently. 59 leading organizations from the travel industry were recognized at this year's event. Niccolo Changsha is proud to be named "Best Business Hotel in Central South and Southwest China", the only winner located in this region. Since 2008, the TTG China Travel Awards have been celebrating the best of Greater China's travel industry. They are modelled after the annual flagship TTG Travel Awards, which honor the world's best travel and tourism organizations. This prestigious annual event honours stellar Travel Suppliers across Airlines, Hotel Chains, Individual Hotels, Resort Hotels, Serviced Residences and Travel Services segments throughout the region. Niccolo Changsha is the fourth luxury hotel in the Niccolo portfolio, operated by Hong Kong-based hospitality management company, Wharf Hotels. Its sister hotels include Niccolo Chengdu, Niccolo Chongqing and The Murray Hong Kong. Soaring 452 meters above the panoramic skyline, Niccolo Changsha occupies a desirable, highly-prized address, crowning the uppermost floors of the new 93-storey Changsha IFS Tower 1, in the heart of Furong district's entertainment and business hub. 241 elegant guest rooms and suites offer a stylish stay above the clouds, ushering in a new era of impeccable hospitality and effortless luxury in the Star City of Changsha. Reportedly the tallest hotel in central China at the moment, Niccolo Changsha attracted much industry attention during its pre-opening phase, and was named "one of the most anticipated hotels to open in China in 2018" by the industry. As expected, the hotel has won many industry awards with its impeccable service, luxury experience and unique contemporary and chic style since its opening on October 29, 2018. Niccolo Changsha is located in Hunan capital's premier address in Furong District entertainment and business hub. Open in October 2018, the hotel offers 241 contemporary urban chic rooms and spectacular suites between the 86th and 92nd floors of Changsha IFS Tower One. Situated in the most vibrant part of the city, the hotel's facilities include contemporary function and meeting spaces offering scenic views of the city and Xiang river, elaborate conference and social event venues including The Conservatory, the luxurious Niccolo Ballroom, a sophisticated Tea Lounge, Bar 93, Niccolo Kitchen, The Spa at Niccolo and Fitness Centre. Reservations may be made at niccolohotels.com. Emanating the spirit of discovery, Wharf Hotels, a wholly owned subsidiary of The Wharf (Holdings) Ltd, is based in Hong Kong and currently operates 17 owned or managed hotels under Niccolo or Marco Polo Hotels in Hong Kong, China and the Philippines. Niccolo Hotels was added to the group's portfolio in 2015 as the new luxury collection, positioning the brand as contemporary chic. The Murray, Hong Kong, a Niccolo Hotel, opened in January 2018 as the brand's flagship hotel, with 1 new Niccolo hotel currently under development in China following successful openings in Chengdu, Chongqing and Changsha. Marco Polo's international deluxe hotels in established locations within mainland China, Hong Kong and the Philippines maintain their ethos to explore, discover and experience a destination, drawing on the philosophies of their namesake, Marco Polo: an adventurer, a traveller, an entrepreneur and a connoisseur of culture - just as Marco Polo's modern travellers are today. Further details are available at wharfhotels.com. ABU DHABI, UAE, April 13, 2019 /PRNewswire/ -- Following an initiative held by the World's Leading Waterpark to celebrate the Year of Tolerance, which took place on Friday April 12, Yas Waterworld succeeded in its attempt to grab the Guinness World Records title for 'Most Nationalities in a Swimming Pool." The event kicked off at 10:00AM and was held in the presence of Guinness World Records representative as well as Farah Experiences and Yas Waterworld senior management, seeing over 102 nationalities come together to represent their home countries and celebrate the values of co-existence and tolerance that the UAE has long embraced. Most Nationalities In a Swimming Pool at Yas Waterworld. Commenting on the record-breaking event, Leander De Wit, General Manager of Yas Waterworld said: "It fills me with an immense amount of pride to be able to celebrate this milestone record in honor of the Year of Tolerance, which was made possible thanks to the co-existence of cultures and rich diversity that we are blessed to have in the UAE. On behalf of the entire team at Yas Waterworld, I'd like to express our gratitude to our beloved guests who joined us on this momentous day to help us achieve the record title of 'Most Nationalities in a Swimming Pool'." Showcasing a deep sense of community, Yas Waterworld guests reveled in the celebratory atmosphere as they held their countries' flags while standing in Amwaj Wave Pool to help take the waterpark to Guinness World Records fame. The waterpark's guests from across the globe then went on to enjoy a day filled with family-friendly adventures, including complementary face painting and the park's 40 exhilarating rides, slides and attractions. Located in Abu Dhabi, Yas Waterworld is a one-of-a-kind waterpark that draws inspiration from the UAE's pearl diving heritage offering families fun-packed adventures, the warmest welcome, and the most engaging themed experience. Home to more than 40 exhilarating rides, slides and attractions, and a diversity of seasonal events and shows, guests of Yas Waterworld can enjoy the chance to create new memories with every visit. Open since 2013, Yas Waterworld has garnered more than 30 industry awards and accolades. Recognized with the "Certificate of Excellence" every year since its opening, Yas Waterworld earned its place in the TripAdvisor "Hall of Fame" in 2018. Voted the 'Middle East's Leading Waterpark' at the World Travel Awards in April 2018, Yas Waterworld later received recognition as the 'World's Leading Waterpark' in December 2018, cementing its position as Water's Greatest Playground. To top it off, Yas Waterworld was also recognized as Best Water Park by the MENALAC awards 2019. Considered the pearl of Yas Island, the UAE's premium leisure and entertainment destination, Yas Waterworld combines fun aquatic adventures with local personality to provide guests with an experience unlike anything else.